You have two choices with manuscript formatting — you can either format first or format last. 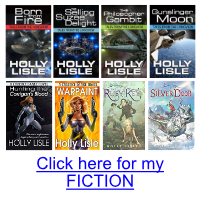 I format first — that is, I do the whole novel in exactly the same format in which I will submit it. It uses more paper for print-outs, but I can revise my work easily, and I don’t have to mess around with it later — when the words are done, so is the formatting. Once you’ve decided when you’re going to format, however, the next question is… how? 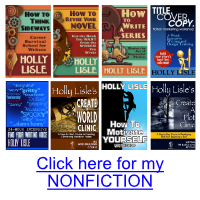 I use two formats — one for novels, and one for short work, both fiction and nonfiction. I have never had a complaint about my formatting, I have never had work bounced for formatting, so I know that both of these formats are professionally acceptable. These are not the only correct manuscript formats out there. There is, contrary to beginner myth and legend, no one single correct format, nor even one single correct typeface. Header — right justified, contains the following information:Last name/ TITLE/ page#A header does not belong on the title page. Start headers on page two of the actual manuscript. First labeled page number should be 2. Body of the story or article — drop down two lines and begin. Scene or section breaks — drop down two double-spaced lines, insert and center the # character, drop down two more double-spaced lines, and begin your new scene. Header — should be in the upper right-hand corner of the page, and page number should be 2. Body text — begins on the first line, doublespaced throughout.